Posted on Wed, Mar 14, 2012 : 12:05 a.m. The Huron girls basketball team celebrates at mid court at Grand Blanc High School after advancing to the Class A state semifinals. GRAND BLANC - For two minutes, it looked like the Huron High School girls basketball team didn’t belong at the Class A state quarterfinals. Saginaw Arthur Hill looked faster. Saginaw Arthur Hill looked stronger. Saginaw Arthur Hill looked less nervous. Saginaw Arthur Hill had six points. Huron had none. Saginaw Arthur hill looked like it belonged. Huron coach Steve Vinson called a timeout, not to remind them they belonged, but to remind them to play the way that got them there. The players knew they belonged, they just weren’t playing like it yet. After the timeout, Huron looked like another team, outscoring Arthur Hill 30-9 for the remainder of the half and dominating the rest of the way in the 52-39 win. The River Rats didn’t just play well enough to look like a quarterfinal team, they played well enough to look like the first girls team to make the final four in school history. That moment passed and Huron was caught up in nothing else the rest of the way. Unless you count the postgame celebration. No one had a bigger smile on her face than senior captain Devin Talley who has led Huron all year, but wasn’t necessarily at her best in the team’s first regional championship since 1995. Talley wasn’t able to play in the opening round of regional due to a flagrant foul in the district championship game, and in the regional championship game deferred to the hot hand, freshman Payton Sims. But for Huron to reach its ceiling as a team, its best player had to eventually play her best on the biggest stage. Talley did that on Tuesday, with a game-high 18 points, making tough shots in the first half, and hitting 6-of-8 free throws in the second. It was enough to even get a high-five from Vinson as she left the floor in the final seconds. An accomplishment in its own right with Vinson, who rarely breaks character before the final horn sounds. "I was just so happy," Talley said. 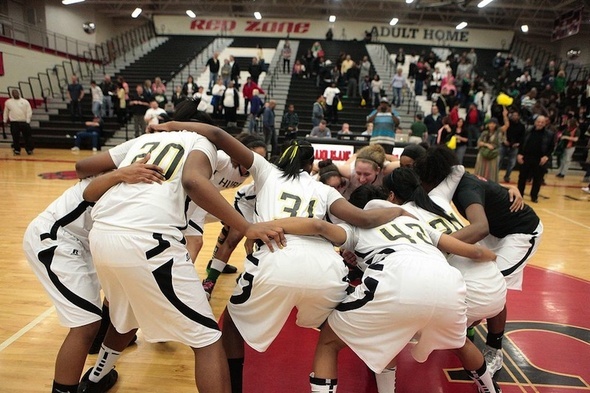 "To be heading to Breslin, it's what we've worked for all year." Now Huron will have the opportunity to prove it belongs in the conversation as one of the better programs in the state. The boys team did that with a state finals run two years ago and now, behind a 19-game winning streak, the girls have that opportunity as well. Huron boys basketball coach Waleed Samaha had every reason not to attend Tuesday’s game. His boys team had suffered a disappointing loss in the first round of regionals the night before. But that’s not his style, so he was there front and center on Tuesday. Samaha had every reason to sit in the stands and keep to himself. Maybe reminisce one of his greatest moments as a coach. The Grand Blanc High School gym is the place where his River Rats defeated the same school -- Saginaw Arthur Hill -- to advance to the boys semifinals two years ago. That’s even less his style. Samaha doubled as the team water boy on Tuesday, filling up cups and distributing them to players, cleaning up spills on the floor and living and dying with every make and miss. "Just to have a small roll in it to get water for them, to be here to experience this with them, it’s special, it’s a special experience," Samaha said. "They’ll be in a whirlwind the next few days, it’s a lot of fun." Talley said she was pumped when she looked to see who was giving her water and it was Samaha. Vinson appreciated the assistance, both during the game and leading up to it as well. "For him to show up after the tough loss, that means a lot. Coach gave me so much advice," Vinson said. Vinson needed the water too. "He was bringing water to me, like, 'coach, you gotta stay hydrated. You gotta keep your composure,'" Vinson said, laughing. Fans wishing to sit behind the Huron bench during its semifinal game against Grosse Pointe South (Friday, 2:30 p.m.) can purchase tickets from the Huron Athletic office inside of Huron High School starting at noon on Thursday. Tickets are $8. Fri, Mar 16, 2012 : 2:12 a.m.
looks like Huron is dominating Washtenaw county in boys and girls basketball. And from the looks of it, both have a lot of young kids on their rosters so they are going to dominate for years to come.